As a coach, you support your clients in getting real – getting real about who they are, what makes their hearts sing, defining success on their own terms, and living the life they imagine. 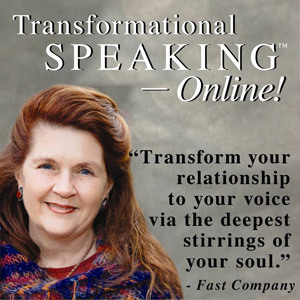 Why would you not approach your speaking in the same authentic, enlivening way? 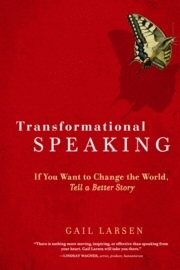 There’s a mystique about speaking that convinces us there’s “a way” to do it. Step aside from that myth and consider your way. When you think there’s “a way” to follow that will lead to fame and fees, it’s easy to edit and rehearse yourself out of the magnificence that is your birthright. That individuality and originality is what will make you a standout speaker, just as it makes you a standout coach. the age of information . . . When you use speaking to build your business, you must speak that “one good word” to exactly the right clients for you so that they truly hear your essential message rather than listen only to your information. This “one good word” creates an emotional connection, and the emotional connection is what moves a person to hire you. 2. Go beyond the Comfort Zone to the Home Zone™. To truly touch and inspire another, great speakers move from the comfortable recitation of facts and figures to the Home Zone of stories and feelings. This deceptively simple act moves you beyond a professional connection to a human connection, where change can be inspired. 3. Discover your “Original Medicine.” Indigenous cultures teach that each of us is unique, nowhere else duplicated. Your Original Medicine reflects your individual gifts and talents to be revealed in your life, your work and your speaking. Honoring your originality requires the willingness to stand out rather than fit in. 4. Be yourself – everyone else is taken! This is my core message and one that will support you in lining up like a bar code with just the right clients for you. With this approach, your business will grow organically because you are aligned with your Original Medicine. 5. Know your core message. If you had just one-minute to tell the audience what you most want to say, what would it be? Imagine sitting up in your casket and saying, “This is what I want you to know!” This “coffin communiqué” can get you clear on your core message fast! 6. Deliver your core message in every presentation. 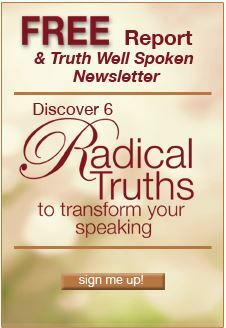 No matter the audience or the subject you are asked to speak on, offer the essential message you are here to give. If you do not, you won’t show up as the original you are. 7. Think creatively to align topics to your core message. When you are asked to speak on a topic that is not your expertise, propose what you do offer applied to the needs of the group. 8. Storyboard your presentation, don’t script it. Use sticky-notes to identify and arrange your key ideas rather than rigidly script your speech. This approach allows you to prepare in advance and focus on what you want to communicate, while remaining spontaneous and connected to the audience in the moment. 10. Include audience participation in your presentation. Q&A, feedback, and group interaction help your listeners connect to you and each other. Be sure to demonstrate your capabilities and magic through in-the-moment coaching. It allows people to experience what you do rather than just hear about it, so don’t hesitate to ask a volunteer to come forward with a issue on which they would like to be coached. 12. Remember, laughter is the shortest distance between two people. In professional speaking it is said, “You don’t have to be funny to speak, only to get paid for it.” Laughter breaks down resistance and creates connection. Even if – or especially if – your message is serious, find places in your presentation to lighten up and have fun!